Correct steering stabalizers for 94? Discussion in 'Modified 1991-1994 Explorers' started by gmanpaint, June 24, 2011. 2" lift running 33"x12.5" BFG KM2. Getting the death wobble and want to add a stabilizer. Problem is which one? Any links, part #'s and brands are appreciated. Here is a shot with it installed.. It wasn't hard to install. Just had to drill a few holes in the cross member. It did "help" but it didn't fix the bad 45mph wobble we had.. In our case, bent rims (2 of them) were causing the issue. You might try rotating first the left front and rear tire, then the right if the problem still exists... hopefully it goes away! Bent wheels, out of round tires, bad balance jobs, etc... all can cause the wobble. I removed my stabilizer, but I'm pretty **** about tires/rims too. Tires have less than 10k, and are dyno bead balanced to specs. Wheels are not bent, dented, or out of round. 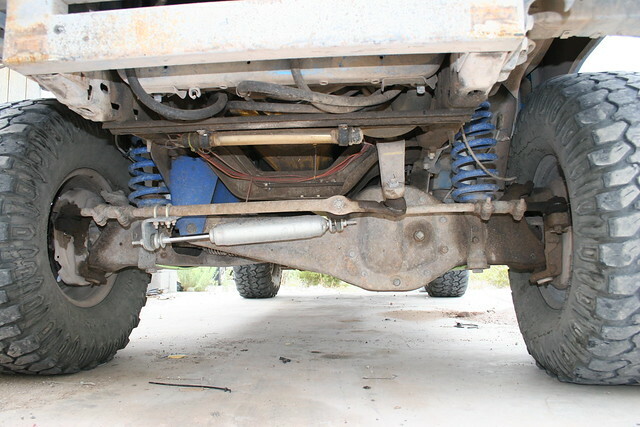 I will be changing ball joints, and tie rod ends as well. I have read that a stabilizer is just a band-aid to some other issues, but also have read that they do help when going to bigger tires. When I run the 31x10.5 AT, there is no death wobble at any speeds. I want the 33's back on, but need to do the work first. Stupid Suggestion: Have you checked your hub bearing and races? If those are loose or just plain screwed, it can cause some serious wobble issues; before, ya know, exploding. The rig has just had the "Once" over as it was due for inspections. Nothing serious was found, but the tie rod boots have a hole in them and the grease escapes. I'm sure the entire front end can use a rebuild sometime in the future, but it's really not that bad right now. The Hubs have been converted to manuals, and I check the spindle nuts routinely. James Duff kit work on stock set up or is it used with one of their lifts? I have to agree with Nedwreck, you probably have some issue with your tires (if not balancing, maybe one of them is out of round). I have 35x12.50s on mine and never a hint of a wobble, no stabilizer (my tires were balanced dynamically using weights on both sides of the rim). Sorry, but the wheels and tires are fine. I have them on a different rig right now and there smooth as glass. It probably is something in the suspension components. It's great that you've verified everything. I just took off a set of A/Ts due to a developing wobble, the M/Ts wobbled too.. then I bought a used set of Interco M/T's and all my problems went away. All this in the last week or two. Argh. I had pretty bad wobble at 30, 45 and 70mph running only 31's. It ended up being the toe and camber were off. After an alignment everything is great! I agree that the stabilizer is a band-aid for other problems. I run 35s and I can't tell the difference with or without the stabilizer when it's aligned properly. That being said, if you offroad at all it's a good idea since things can happen on the trail which cause your alignment to be out of whack. The stabilizer can make for a much less stressful drive home. I think the alignment is off a bit with the 33's. The camber is def more noticeable with the 33's on the pass side. I did have the camber spacers changed when going to the 31's, and I might need to get them changed again and another alignment done. OK, I have a JD stabilizer shock, & a Rancho Mount kit. Since Maniak has got his to work fine with the Rancho kit, thats what I decided to use, and the JD shock had a great price. I actually forgot about this thread, and glad I found it again. Going to try to get this installed today. Man so did i.the problem is with the fa600 arm.mine fit and have been using it for awile now.i had to flip the mount around and mount it to the inside of the motor crossbar where stock they want you to mount it to the outside.the shock does rub on my steering arm at full lock tho.if you dont have the fa600 arm then it will mount jist fine. This is going on a stock set up. It has the F-150 coil spacers for a tiny lift is all. Hoping it works fine. My steering bars are perfectly straight across right now, so crossing the ole fingers that it works with no rub issues. It will fit fine if you dont have the fa600 arm.just use all the jd stuff and send the other back.or atleast try it with the jd stuff first. All I have is the Rancho mounts. I already had it, so I didn't order the JD mount kit.